Synopsis: What are you doing at his age? Age 16, TOP gained 400,000 Baht monthly from playing online games. 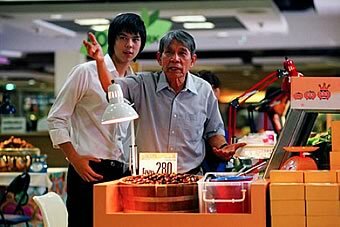 Age 17, He was willing to fail school and instead earned money from selling chestnuts for 2,000 baht. Age 18, His family went bankrupt and remained 40 million Baht in debt. 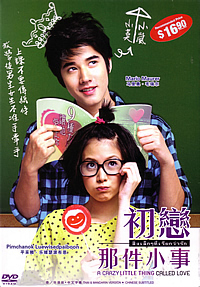 Age 19, He released ‘Tao Kae Noi’ seaweed to more than 3,000 branches at 7-Eleven. At this present, Top is a 26-year-old businessman, the owner of the bestselling seaweed in Thailand. He owns 85 percent of the market share which is equivalent to 800 million Baht a year, and has 2,000 employees in his company. 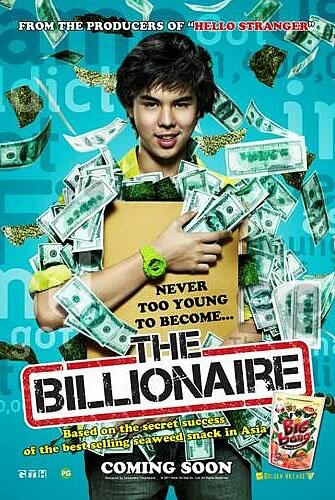 “The Billionaire” is an Inspirational Movie tells about a Thai teenager who used to waste his time in playing online games until one day something happens that turns him into a billionaire. Envy is probably the inevitable reaction when we hear of someone who’s made it big in life, but even as most of us would long to enjoy the same kind of success they have had, few would possess the necessary attributes to attain that success in the first place. Indeed, we can’t all be like and aren’t all like Aitthipat "Top" Kulapongvanich, the 26-year-old Thai billionaire who was scarcely out of his teens when he found unexpected success in the form of fried seaweed- and whose fascinating life story is the basis of director Songyos Sukmakanan’s biopic. Right from the beginning when a 19-year-old Top audaciously walks up to a bank officer and asks for a 10 million dollar loan, the film establishes unequivocally the kind of person he is. What brings him to that point in time is the subject of two-thirds of the movie, told in flashbacks as Top relates his intriguing life story to the officer. Sukmakanan rewinds the clock as far back as 2002, when the business-savvy Top first chances upon a lucrative money-making opportunity selling weapons within a MMORPG (massively multiplayer online role-playing game) for real cash. Before you scoff at the idea, let it be known that Top manages to earn enough to buy himself a car, which he impetuously parks in the principal’s reserved lot at school. Top’s entrepreneurial instinct is one of the highlights of the film, as we watch how quickly he perceives and seizes business opportunities- from selling cheap DVD players to roasted chestnuts and finally to his lucrative fried seaweed- using his powers of observation and a sense of derring-do. How many of us can claim to have the same guts as Top, diving headlong into a new venture before fully assessing its viabilities; or the same perseverance and sheer tenacity to be able to pick ourselves up with each failed endeavour- and it is precisely these attributes that should make this portrait of opportunity and risk a thoroughly gripping one, even more so given that Top began when he was only in his late teens. It comes as a surprise then that this biopic isn’t as consistently engaging as it should be, but that’s the result of Sukmakanan’s tendency to overplay the melodrama at least in the first half of the movie. Especially after each business setback, Sukmakanan tries too hard to emphasise the gravity of Top’s despondence, and the effect is equivalent to hanging a lead weight around the film’s neck. 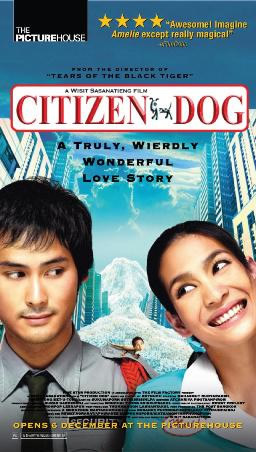 The scenes between Top and his parents- especially after the latter reveals that they are fleeing to China to escape from imminent bankruptcy- are just as leaden, and the affected way by which the characters interact with one another only further drains what life there is in these sequences. As a result, the pace of the film sags perceptibly after a spirited opening that shows the high-school student at the top of his game (pun intended) and struggles to match the same levity and energy. Ironically, the film works best when Sukmakanan lets the strength of Top’s rags-to-riches tale speak for itself. Thankfully then, he doesn’t try too hard to play up the bond between Top and the family’s butler whom he simply calls Uncle. Like Alfred to Bruce Wayne’s Batman, Uncle’s unwavering devotion to Top as he stands stoically by him through every one of his wild ideas- assisting to roast his chestnuts or fry his seaweed day and night- is genuinely moving. 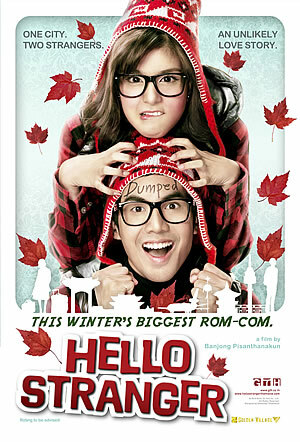 Their scenes together have an artless charm, and are at the core of Top’s coming-of-age. The film also shines as a valuable lesson to what it takes to make a successful business. Besides the inevitable hard work that needs to go into making your product right, there are also other equally important factors such as product packaging, marketing, and distribution- and Sukmakanan lets none of these details slip as he follows Top’s journey to get his ‘Tao Kae Noi’ seaweed snack on the shelves of over 3,000 7-Eleven shops all around the country. It is in the second half that the movie truly finds its stride, moving along at a steady gallop and engaging its audience at every turn despite having an ending that we already know about. Similarly, Patchara Chirathivat also takes half a movie to come into his own as Top. Only his second leading role after last summer’s surprise teenage hit ‘Suckseed’, Chirathivat is sadly nondescript in the first half of the film, with a listless performance that lacks the depth necessary to fully convince audiences of the extent of the disappointment his character must have faced with each unsuccessful business attempt. Fortunately, the scion of Thailand’s Central Department Store family is better off playing the poised and confident Top once his character finally hits the jackpot with his seaweed idea. Chirathivat also seems much more comfortable in the role around veteran director Piak Poster (who’s making his acting debut at the grand old age of 80), and Poster easily gives the film’s most unaffected and unexpectedly moving performance that outshines Chirathivat’s own. Despite its flaws, this biopic of one of the youngest- if not the youngest- billionaires in Thailand is never less than interesting. It is also especially relevant to our society, often criticised as being risk-averse and excessively academically-oriented- a solid testament to the fact that there are many roads to success in life, and taking the one less travelled will still get you there if you never give up. And for every one with that bit of an entrepreneurial spirit, it is also the perfect source of inspiration and motivation to keep on going and fighting for what you believe in.